In 1981, or so, I attended the Alberta College of Art. I was five. Or so. Being the youngest student by about fifteen years (and not “technically” a student) could have been daunting, but as luck would have it, my mother was also a student and introduced me to her friends. I recall being a very popular part of her gang. I also remember well the feeling of confidence that filled me as I skipped across campus, at home amongst my artist colleagues. It is good to be five. My wee brain soaking in the enthusiasm, the constant creating, the inspiration exchange. This is when my collaboARTing began. One project in particular was a simultaneous joy slash living terror. My mother leading me to the cold damp basement, lying me on the hard floor, placing straws up my nose, and plastering my entire body. I’m cold. Told not to move. The logical half of that little girl knew that the situation required some level of heightened anxiety, but mom had proven trustworthy to that point. More than that, I was entirely bought-in to the project underway. 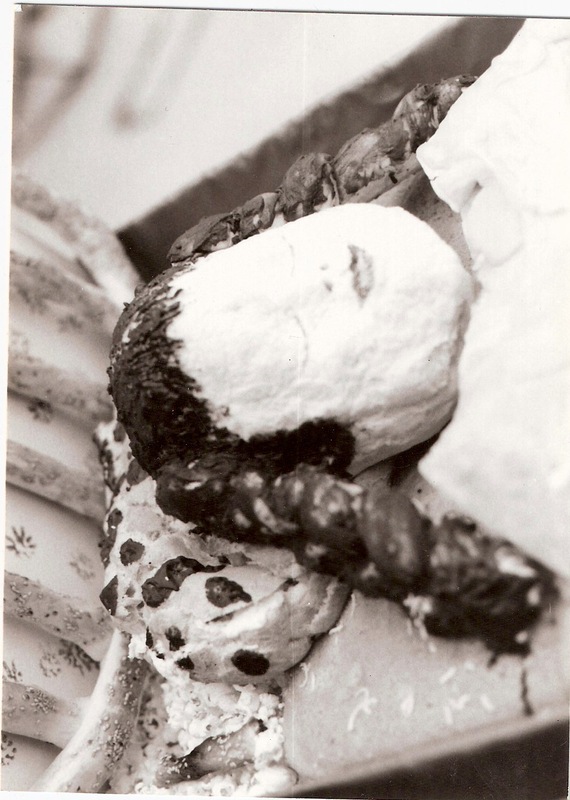 What joyful little girl doesn’t want to be a part of building a life-size edible sculpture of herself made of cake? I also wonder if my mother knew how much I believed we were partners in all of that? No wonder collaboARTing is such bliss. This is what filled my head Saturday afternoon, stretched out on my dinning room floor covered in plaster, collaboARTing with my gold star AA on “body parts”. It is started. I like where it is going. Thank you mom for getting that started. Thank you AA for getting this started. This entry was posted on Sunday, February 27th, 2011 at 9:34 am	and tagged with art in ottawa, collaboarative art, collage, ottawa art, ottawa culture and posted in Art In Ottawa, Collaborative Art, Collage, Ottawa Art, Ottawa Culture. You can follow any responses to this entry through the RSS 2.0 feed.